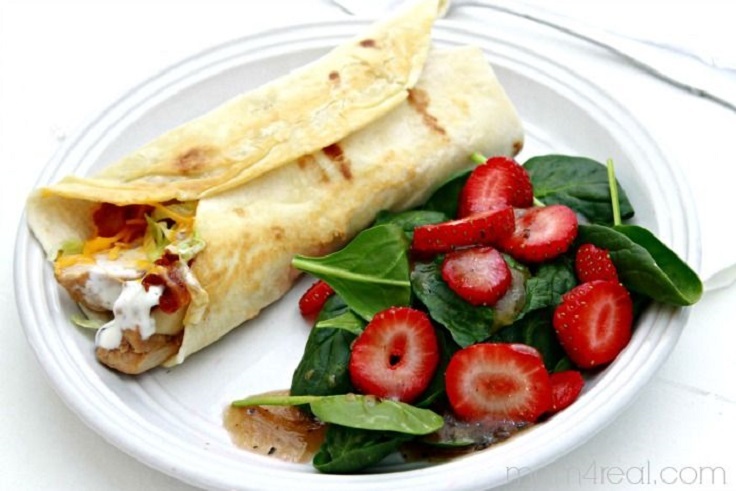 An interesting way to make a yummy, but low-cal wrap. The grilled chicken ranch wrap idea is an easy one for everyone, even for the beginners. So take a quick look at the recipe and start with making it right away! There is a recipe for every specialty… you just have to click on the link below the text. The links don’t work… When I click on them, the page is blank…..
Am I missing the recipes? The menu looks fabulous though. No actually, there are no links for any of these. I’d love that corrected as many of these sound wonderful and I’d love to have the recipe. Yes actually, there are links for each. As instructed, they are below each photo, underneath the text. Maybe for you but clearly by the comments, that’s not true for all of us. a recipe would be nice! For everyone that can’t find the recipes, click under each photo on: Recipe and Photo credit to….. and this will take you right to each recipe!! This site isn’t reader friendly at all. Tried everything to get the recipes. The links underneath go to a blank page. Where do we go to get the actual recipes? When I click on the link under the photo, only a blank page appears. This happens for every one. Has anyone ever gotten these recipes? I love chicken! Great recipes! These look really yummy. I’m not sure which one to try first! In what world are potatoes & pasta low carb? Click on the link directly below each picture. I have gotten all the recipes. Some times, I guess the way each person loads these things, it’s either the link or the picture that gets you to the recipe. Kind of frustrating, but they are here! Looks yummy!! Most of these recipes are not low carb. Funny how so many people are pointing out that many of these recipes are far from low carb and no one from this site is addressing the issue. Nothing worse than misleading links and articles. I’ll make sure to stay far away from this site in the future! We appreciate your comment, but are the links in the article misleading? Yes, they are misleading. The article is supposed to be low CARB meals. Yet potatoes, pasta, and tortilla/wraps are used in several dishes. Those things are high carbs foods. Most low carb diets give a person 0-20 grams of carbs a day. When 1 tortilla takes away 12 of them, it doesn’t leave much else for the person to eat. Definitely not low carb. Every recipe looks fantastic! I especially want to try the Mushroom Chicken Asiago one as it combines three of my favorite ingredients 1. Wine (most important 🙂 2. Chicken 3. Mushrooms.